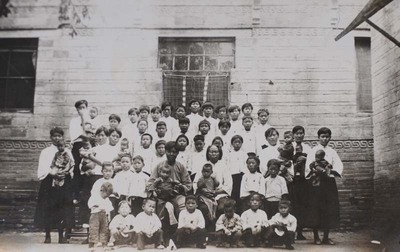 Catholic orphanage: “because of the recent bad years, I have in my parish alone received more than 25 orphans these last few months.” Boy and girl orphans and the Christians taking care of them. Catholic orphanage. 1932/1933. Société des Auxiliaires des Missions (SAM) China Photograph Collection, Whitworth University Library, Spokane.